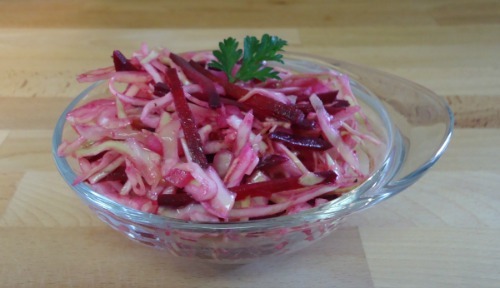 Cabbage Beet Coleslaw - A great dish to help cleanse the liver. This cabbage beet coleslaw is not only a liver loving food but it also makes a delicious low calorie salad and a welcomed addition to any weight loss menu. This one happens to be one of my favorite snacks. I just love the tangy flavor it offers and the satisfying crunch it gives with every spoonful. You will need about a ¼ head of cabbage, one good size beet and one good size carrot. Remove the first one or two outer layers from the head of cabbage so it is clean and cut into quarters. Take the carrot and the beet, wash well and peel. Have 1 sweet onion cleaned and ready to dice (though we only need part of it). Which style suits your life better? The cabbage in coleslaws are always sliced thin but the other veggies are either prepared julienne or shredded and here is the difference to help you decide which method suits your life style more. Julienne is when the food or veggies are cut into long thin strips (similar to wooden matches) in which the pieces look fairly uniform. This method can be achieved easily with a mandoline slicer. Usually mandolines come with interchangeable blades which offer a variety of styles to choose from. Use the slicing blade for the cabbage and the julienne blade for carrots and beets. This kitchen gizmo has a lot of pluses as it needs no electricity, it is not heavy and is easy to wash store and use. Shredded is similar but not uniform and smaller in size. This method can be achieved easily with a food processor. If you choose to use a food processor use the slicing disc for the cabbage and use the shredding disc for carrots and the beets. But have no fear if you don’t have the kitchen gear both styles can be prepared with a simple sharp kitchen knife. For this particular recipe we will continue julienne style as my preference is the mandoline and I like how the uniform pieces are so pleasing to the eye. Thinly slice the cabbage and cut the beet and carrot julienne style. Then take and dice the onion, you will probably only need half of it (enough to get about ¼ cup). Add all of the ingredients into a bowl, mix well and add salt and pepper to taste if. This low calorie salad makes about 4 – 6 servings. If you choose to use a store bought dressing try to stick with ones that are made with olive oil, as it offers many health benefits compared to other oils. Olive oil may have a few more calories than some other vegetable oils, but don’t be fooled. Healthy calories can help with weight loss. Beware of bad oils that can clog the arteries, choose healthier oils that help cleanse the liver and help keep arteries clear of build up. As we all know good liver function is the key to weight loss. Supermarkets are always aware of the consumer’s needs which are why today there are several brands of olive oil and vinegar dressings available.